Hosseini-Motlagh, S., Ahadpour, P., Haeri, A. (2015). Proposing an approach to calculate headway intervals to improve bus fleet scheduling using a data mining algorithm. Journal of Industrial and Systems Engineering, 8(4), 72-86. Seyyed-Mahdi Hosseini-Motlagh; Peyman Ahadpour; Abdorrahman Haeri. "Proposing an approach to calculate headway intervals to improve bus fleet scheduling using a data mining algorithm". 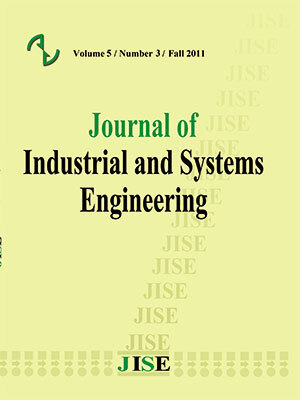 Journal of Industrial and Systems Engineering, 8, 4, 2015, 72-86. Hosseini-Motlagh, S., Ahadpour, P., Haeri, A. (2015). 'Proposing an approach to calculate headway intervals to improve bus fleet scheduling using a data mining algorithm', Journal of Industrial and Systems Engineering, 8(4), pp. 72-86. Hosseini-Motlagh, S., Ahadpour, P., Haeri, A. Proposing an approach to calculate headway intervals to improve bus fleet scheduling using a data mining algorithm. Journal of Industrial and Systems Engineering, 2015; 8(4): 72-86. The growth of AVL (Automatic Vehicle Location) systems leads to huge amount of data about different parts of bus fleet (buses, stations, passenger, etc.) which is very useful to improve bus fleet efficiency. In addition, by processing fleet and passengers’ historical data it is possible to detect passenger’s behavioral patterns in different parts of the day and to use it in order to improve fleet plans. In this research, a new approach is developed to use AVL data to investigate relationship between headway change and passenger downfall rate. For this purpose, a new method is developed that is called Intelligent Headway Selection (IHS) approach. The aim of this approach is finding similar days from passengers’ behavior perspective in the dataset and by focusing on unusual patterns of each group, headway changes effects on passenger downfall rate is being studied. In this approach, in the first step, each day is classified into specific time periods (like half of hours) and the passengers’ behavior pattern is detected for each day during the specified time periods. Then, in the K-Means algorithm, Euclidian distance measure is replaced with Dynamic Time Warping (DTW) algorithm to enable the K-Means to compare time series. The modified K-Means algorithm is used to compare days in the dataset and categorize similar days in the same clusters. Then, headway – passenger per minute plot is created for each time period to detect unusual patterns. Then, a Headway Interval Detection Procedure (HIDP) is developed to use these unusual patterns to find suitable headway values for each time period. Afterwards, these plots merged and the final headways are calculated. Lobel, A., 1999. Solving large-scale multiple-depot vehicle scheduling problems. In: Wilson, N.H.M. (Ed. ), Computer-Aided Transit Scheduling. Lecture Notesin Economics and Mathematical Systems, vol. 471. Springer-Verlag, pp. 193–220.447–458. Kwan, R.S.K., Rahin, M.A., 1999. Object oriented bus vehicle scheduling – the BOOST system. In: Wilson, N.H.M. (Ed. ), Computer-Aided Transit Scheduling.Lecture Notes in Economics and Mathematical Systems, vol. 471. Springer-Verlag, pp. 177–191. Mesquita, M., Paixao, J.M.P., 1999. Exact algorithms for the multi-depot vehicle scheduling problem based on multicommodity network flow typeformulations. In: Wilson, N.H.M. (Ed. ), Computer-Aided Transit Scheduling Lecture Notes in Economics and Mathematical Systems, vol. 471. Springer-Verlag, pp. 221–243. Banihashemi, M., Haghani, A., 2000. Optimization model for large-scale bus transit scheduling problems. Transportation Research Record 1733, 23–30. Freling, R., Wagelmans, A.P.M., Paixao, J.M.P., 2001. Models and algorithms for single-depot vehicle scheduling. Transportation Science 35 (2), 165–180. Haghani, A., Banihashemi, M., 2002. Heuristic approaches for solving large-scale bus transit vehicle scheduling problem with route time constraints.Transportation Research 36A, 309–333. Haghani, A., Banihashemi, M., Chiang, K.H., 2003. A comparative analysis of bus transit vehicle scheduling models. Transportation Research 37B, 301–322.(Eds. ), Computer-Aided Transit Scheduling. Lecture Notes in Economics and Mathematical Systems, vol. 430. Springer-Verlag, pp. 115–129. Huisman, D., Freling, R., Wagelmans, A.P.M., 2004. A robust solution approach to the dynamic vehicle scheduling problem. Transportation Science 38 (4),447–458. P. Furth, B. Hemily, T. Muller, J. Strathman, Uses of archived AVL–APC data to improve transit performance and management: review and potential, Transport. Res. Board (2003). M. Chen, X. Liu, J. Xia, S. Chien, A dynamic bus-arrival time prediction model based on apc data, Comput.-Aid. Civil Infrastruct. Eng. 19 (5) (2004) 364– 376. Q. Chen, E. Adida, J. Lin, Implementation of an iterative headway-based bus holding strategy with real-time information, Public Transport 4 (3) (2013) 165–186. A. El-Geneidy, J. Horning, K. Krizek, Analyzing transit service reliability using detailed data from automatic vehicular locator systems, J. Adv. Transport. 45 (1) (2011) 66–79.